The James River Bridge is a four-lane divided highway lift bridge across the James River in the U.S. state of Virginia. Owned and operated by the Virginia Department of Transportation, it carries U.S. Route 17 (US 17), US 258, and State Route 32 across the river near its mouth at Hampton Roads. 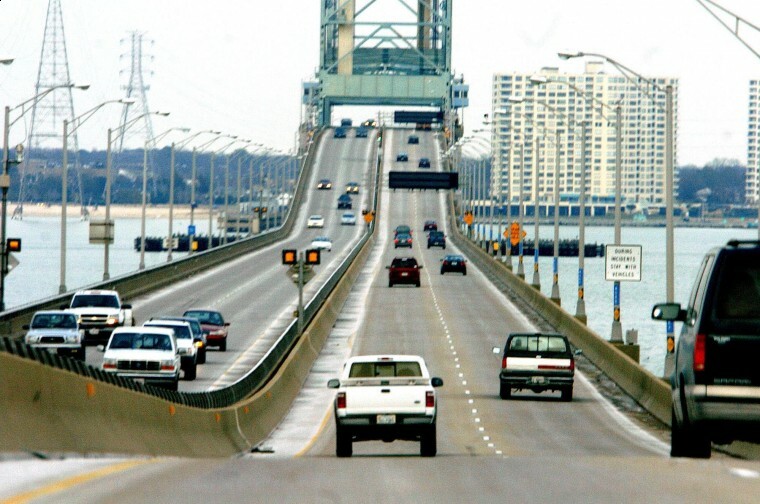 The bridge connects Newport News on the Virginia Peninsula with Isle of Wight County in the South Hampton Roads region, and is the easternmost such crossing without a tunnel component. When completed in 1928, the 4.5-mile (7 km) bridge was the longest bridge in the world over water. The original two-lane bridge was replaced from 1975 to 1982 with a wider four-lane bridge that could handle increased traffic volumes. In 2005, the bridge carried an annual average daily traffic of about 30,000 vehicles per day. At the Newport News end, traffic approaches the bridge at a six-ramp partial cloverleaf interchange, where Mercury Boulevard (carrying U.S. Route 17, U.S. Route 258, and State Route 32 onto the bridge) passes over Warwick Boulevard (U.S. Route 60). After an intersection with River Road and the entrance to Huntington Park, the four-lane divided bridge begins, lying to the southeast of the part of the old bridge that remains as a fishing pier. The 126.5 m (415.0 ft) lift span over the shipping channel, with a clearance of 44.1 m (145 ft) when raised and 18.2 m (59.7 ft) when lowered, is about 1/4 of the way along the 7.0714 km (4.3940 mi) bridge. This allows ocean-going ships to pass en route to civilian port facilities in Hopewell and at the Port of Richmond. The roadway becomes Carrollton Boulevard on the Isle of Wight County end; after a number of intersections, US 258 and SR 32 turn west at Bartlett towards State Route 10 at Benns Church, while US 17 curves southeast towards Portsmouth. The nearest upstream crossing of the James River is the Jamestown Ferry (State Route 31); the next fixed crossing is the 1966 Benjamin Harrison Bridge (State Route 156) at Hopewell. When the bridge opened in 1928, the next bridge upstream was the 1913 Mayo Bridge in Richmond. 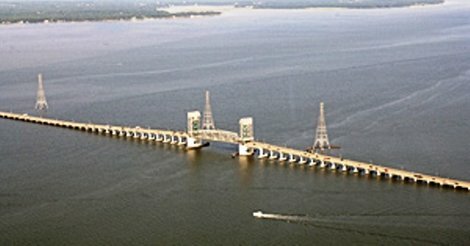 Downstream, both crossings of Hampton Roads are bridge-tunnels for military reasons: the 1992 Monitor-Merrimac Bridge-Tunnel (Interstate 664) and 1957 Hampton Roads Bridge-Tunnel (Interstate 64/U.S. Route 60). 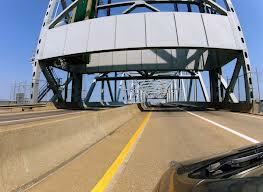 Bicycles, mopeds, and pedestrians are banned from using the bridge; the easternmost crossing for them is the Jamestown Ferry, about 25 miles (40 km) upstream. The State Highway and Transportation Commission banned these transportation modes from using the bridge in 1978 "in the interest of safety", due to high traffic and lack of sidewalks. Once the replacement bridge was completed, they returned to the question in 1983, and decided to continue the ban, since the new bridge also had no sidewalks or sufficient recovery area. The privately owned James River Bridge Corporation was chartered by the General Assembly to build a system of bridges across the James River, Chuckatuck Creek, and Nansemond River, as well as approach roads. 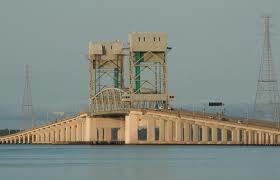 On the Newport News end, the bridge simply ended at an intersection with State Route 39/U.S. Route 60 (Virginia Avenue, now Warwick Boulevard). However, a large system of approach roads, including two smaller toll bridges, was built on the Isle of Wight County side. Traffic coming off the bridge reached a Y intersection at Bartlett, at which it could head west over a private approach road past Carrollton to State Route 10 at Benns Church, or head southeast into Nansemond County. The first of the two smaller bridges was the Crittenden Bridge over Chuckatuck Creek (the county line) at Crittenden, and the second, after passing the road to Hobson and Chuckatuck (now State Route 628), was the Nansemond River Bridge over the Nansemond River. The end of the private approach road was at the current intersection of Bennetts Pasture Road (State Route 627) and Lee Farm Lane (State Route 701), where one could go south to State Route 10 (now State Route 337) at Driver. So the James River Bridge System served not only traffic crossing the James River, but also traffic along State Route 10; the 1928 Chuckatuck-Driver Kings Highway Bridge (now State Route 125) competed with the James River Bridge System for this traffic. The $5.2 million James River Bridge was opened on November 17, 1928, by the press of a button in Washington, D.C., where U.S. President Calvin Coolidge, sitting in the Oval Office of the White House, sent an electric signal to lower into place the upraised lift span over the James River channel. 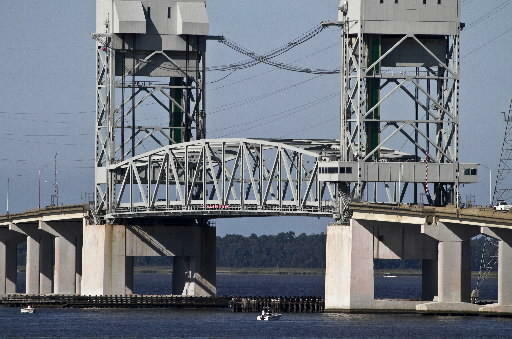 Drivers could now choose to cross Hampton Roads on a fixed bridge rather than one of many ferries. The new bridge was narrow by current standards, with a 20-foot (6.1 m) roadway from curb to curb, and railings much less substantial than found on modern structures. The main lift span was 300 feet (90 m) long; the other two bridges included 110-foot (34 m) bascule spans. When completed, it was the longest bridge in the world over water. From 1928 to 1931, State Route 503, a state highway from Portsmouth via Churchland and Belleville to the private approach road south of the Nansemond River, was added to the state highway system. U.S. Route 17 was moved onto this alignment (from one of the ferries) by 1932, and still uses it today. State Route 258, now part of U.S. Route 258, was extended over the Benns Church approach and bridge by late 1943 to reach the new Mercury Boulevard. Thus all approaches had numbers at the time of the state takeover in 1949. In 1951, State Route 32 was extended from Suffolk over the bridge to end in Newport News, completely overlapped with other routes, "to facilitate the routing of traffic over the James River Bridge System, between points north of Newport News and south of Suffolk"